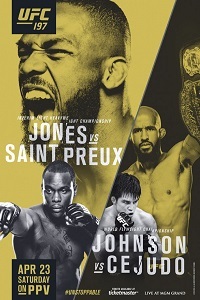 UFC 197: Jones vs. St. Preux (formerly UFC 197: Cormier vs. Jones 2) took place on April 23, 2016 at MGM Grand Garden Arena in Las Vegas, Nevada. Click the stars to rate how good you think UFC 197 was. • Jon Jones vs. Ovince St. Preux (UFC Interim Light Heavyweight Championship): Jon Jones def. Ovince Saint Preux via unanimous decision (50-44, 50-45, 50-45). • Demetrious Johnson vs. Henry Cejudo (UFC Flyweight Championship): Demetrious Johnson def. Henry Cejudo via TKO (strikes) at 2:49 of Round 1. • Edson Barboza vs. Anthony Pettis: Edson Barboza def. Anthony Pettis via unanimous decision (29-28, 29-28, 30-27). • Rafael Natal vs. Robert Whittaker: Robert Whittaker def. Rafael Natal via unanimous decision (29-28, 30-27, 30-27). • Andre Fili vs. Yair Rodriguez: Yair Rodriguez def. Andre Fili via KO (flying kick) at 2:15 of Round 2. • Chris Kelades vs. Sergio Pettis: Sergio Pettis def. Chris Kelades via unanimous decision (30-27, 30-27, 30-27). • Danny Roberts vs. Dominique Steele: Danny Roberts def. Dominique Steele via unanimous decision (29-28, 29-28, 29-28). • Juliana Lima vs. Carla Esparza: Carla Esparza def. Juliana Lima via unanimous decision (30-27, 30-27, 30-27). • Cody East vs. Walt Harris: Walt Harris def. Cody East via TKO (strikes) at 4:18 of Round 1. • Clint Hester vs. Marcos Rogerio de Lima Marcos Rogerio de Lima def. Clint Hester via submission (arm triangle) at 4:35 of Round 1. • Efrain Escudero vs. Kevin Lee: Kevin Lee def. Efrain Escudero via unanimous decision (29-28, 29-28, 29-28).